Ask anyone who has lived through an era of distinct fashion, decor and food and drink if they want it to return; their answer will reflect their specific memories of that time. However, most will agree, if you are going to go retro, do it better than it was done before. If you were born before the mid-1970s, you’ll likely walk into Botanist, look around and admire your surroundings before quickly being overtaken by a sense of déjà vu. The softened edges, the curving banquettes, the endless green foliage, botanical prints and warm metal details may harken back to another time, but the food and drink is new, and now. When it opened this past spring, Botanist became the talk of the town. Reincarnated from its previous life as Oru, this outstanding space has finally received the respect it deserves, as befitting the Fairmont Pacific Rim, and anchoring one of Vancouver’s most notorious see-and-be-seen lobby lounges. You’ll find Botanist’s long, sleek bar at the top of the hotel’s centrepiece staircase from the lobby, outside the entrance to the restaurant. It is anchored just east of the blush-hued sofas of the soon-to-be opened Champagne lounge. The bar is where Senior Bartender Chris Enns works his magic alongside former Bar Stars Grant Sceney (Creative Beverage Director, Fairmont Pacific Rim) and David Wolowidnyk (Head Bartender, Botanist). Enns, previously of the Revel Room and The Diamond, moved to Vancouver in 2014 from Saskatoon. Admitting he is still in tourist mode even after three years (discovering new neighbourhoods and landmarks); he’s equally in awe of his new workplace as he is of Vancouver’s beauty. Opening Botanist was a massive team effort; they stand true to the natural West Coast theme from kitchen to wine program, and of course the bar. In fact, the Botanist bar stars have their very own custom-created lab, the first of its kind in the city – it’s a true cocktail chemist’s dream. The lab sits hidden away behind the bar and its toys include a centrifuge, a dehydrator and sous-vide equipment, among other fascinating futuristic tools. It is a bartender’s artistic studio, where cocktails are developed using culinary approaches. 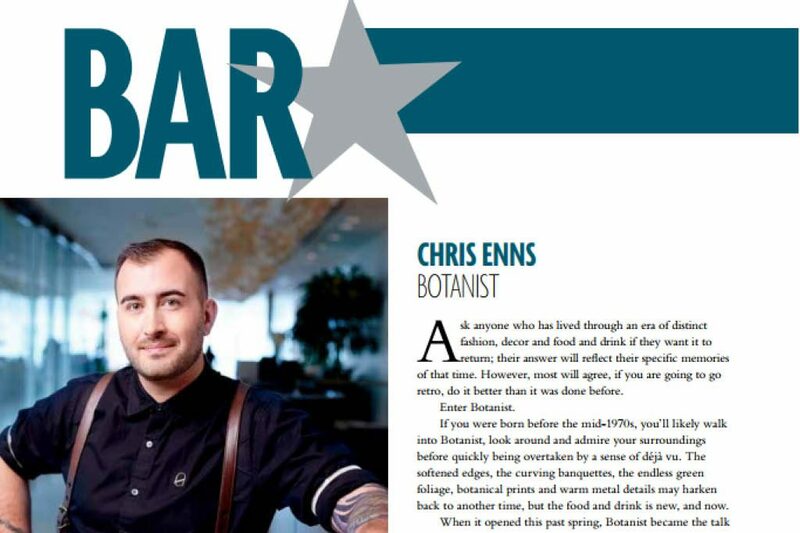 Enns can create healthier drinks by using the lab to extract flavours from seasonal produce and fresh herbs, a fact reflected in their bar list. He loves using natural ingredients in his cocktails, such as hydrating birch water (move over coconut water), nutrient-dense bluegree algae, carrots and yellow beets. Eliminating artificial flavours does come at a cost, as reflected in Botanist’s slightly higher prices. But as Enns underlines, the goal is to drink better, not more. “Virtuous cocktails are good for the body and the soul – but first and foremost, they must taste good,” he says. Your mouth will be watering as you scroll through the list of seasonal libations; simply reading the ingredients in Botanist’s cocktails will immediately make you feel healthier. Personally, Enns loves the classics, primarily martinis and Manhattans, because they are so receptive to interpretation. However, he’s equally excited about Caribbean flavours coming into trend. For the cooler fall, Calvados and brown spirits tend to be highlighted on the cocktail list. Likewise, flavours such as apple butter, honey, capsicum and orange are warm yet still refreshing. Enns and the team had been hard at work since the concept for Botanist was set in motion; now that they have garnered impressive kudos from media, industry peers and guests, a little pressure has been lifted. “We feel comfortable now, we’re in the lane and everything is driving itself,” Enns smiles. Maybe now he can take time to relax and explore, becoming less tourist and more Vancouverite.